Manassas, VA (April 22, 2013) – Trailways’ Voyager GPS Tracking System has been acquired by its original software developer, Lock Media. The software specialist has become a motorcoach industry leader with its comprehensive Ticket Manager Pro 3.0 suite of tools that allows companies to manage all aspects of their operations. Lock Media has big plans to take Voyager to the next level. Until earlier this month, when it was sold outright to Lock Media, the Voyager GPS Tacking System was proprietary to Trailways and used only on it network of buses. The software was managed and hosted by Lock Media since its inception in 2004. This acquisition means that for the first time since 2004, this product will be available commercially. “We look forward to continuing our strong relationship with Trailways. The investments and improvements we plan to make to Voyager will not only benefit Trailways stockholders, but now, other bus companies – including the small independent ones – will be able to profit as well,” Lock said. Trailways Voyager GPS Users- All Trailways Stockholders are still required to complete the GPS System Update form requests (GPS Mandates) annually by May 1. 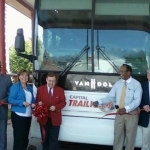 From now on, Capital Trailways buses won’t just be passing through Selma, as it’ll now call the city home. Trailways will now have departures from Selma, as a ribbon-cutting ceremony will officially welcome the business back on Tuesday at 10 a.m. at its location on Broad Street. Trailways is making its return, after leaving from Selma years ago. Mark Szyperski, corporate vice president of Trailways, said Trailways will fill a need for customers in rural locations thanks to a federal grant it applied for through Alabama Department of Transportation, which helped it get started. Szyperski also said the service will fill many needs of the community. “The general public — and we’ve noticed this at Trailways throughout the United States — are coming back to buses because of the cost of fuel,” Szyperski said. “It’s just so much easier to leave your car at home and ride and go someplace. Trailways will now have departures from Selma, as a ribbon-cutting ceremony will officially welcome the business back on Tuesday at 10 a.m. at its location on Broad Street. Trailways is making its return, after leaving from Selma years ago. The grant doesn’t pay for service, but gets it off to a start so it can become self-sustaining. Szyperski said Trailways will offer a number of advances for customers, including wireless internet, and purchasing tickets will be easy. Szyperski also said the service will fill many needs of the community. “The general public — and we’ve noticed this at Trailways throughout the United States — are coming back to buses because of the cost of fuel,” Szyperski said. “It’s just so much easier to leave your car at home and ride and go someplace. There are some people who absolutely need the service and have not had the ability. For example, a person will be able to go to college courses in the morning. We’re also going to go at 7:30 in the morning to Tuscaloosa for example. The V.A. hospital is there."